We left camp a little before 7am. 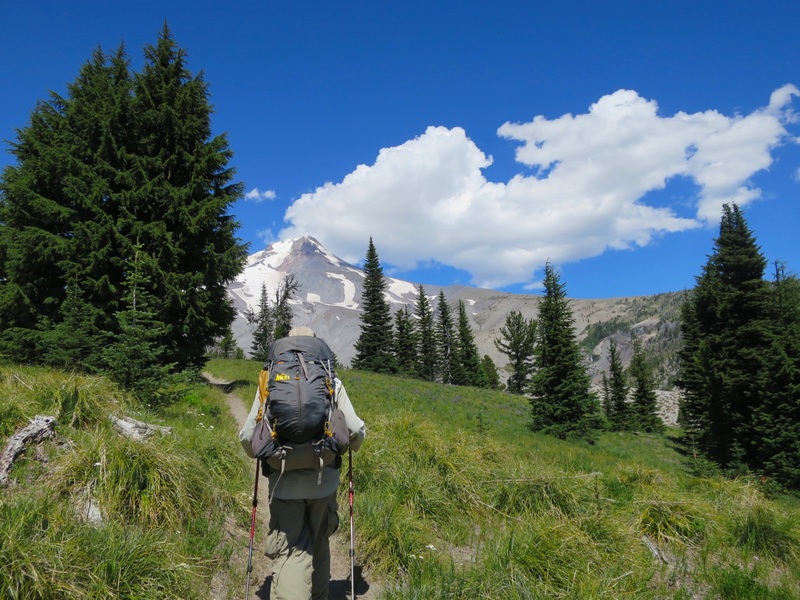 With all day and only 14 miles to Timberline Lodge we were in no hurry. So when we came upon huckleberry bushes, we stopped numerous times to pick them. Some of the stops were longer than others, all dependent on the sweetness of the berries. The trail led us through the cool shade of the trees. 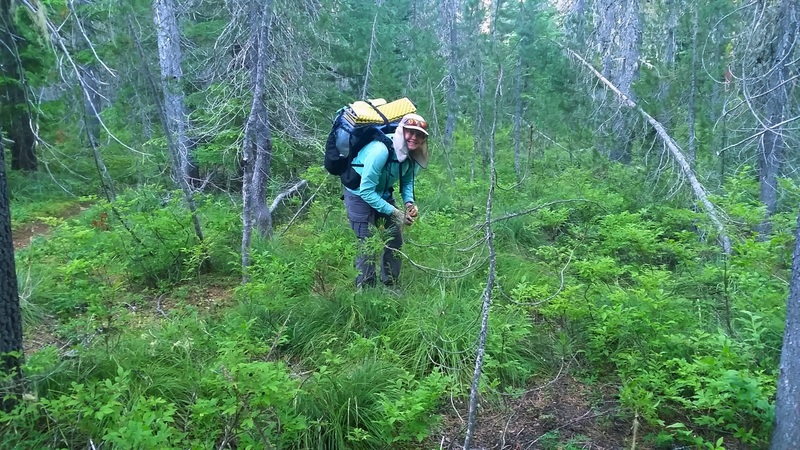 Oregon soil is soft and it made our feet happy. Through the trees we snuck more views of Mt Hood. 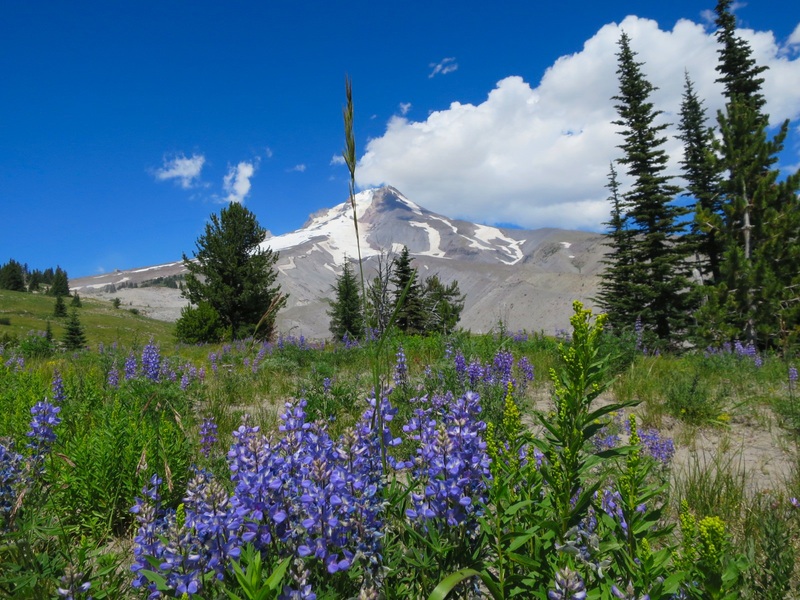 The brilliant white snow on the mountain stood out in contrast to the dark trees and bluebird sky. We enjoyed a late breakfast on a log surrounded by huckleberry bushes. The wind kept us cool and our bodies appreciated the rest. With the hope of finding ice cream at Timberline Lodge, we collected huckleberries in one of our Talenti containers for later. After we crossed Hwy 35 we began to climb. Thankfully most of it was in the shade. The trail was wide, flat and without rocks. It almost felt like an old road. After 2.75 miles we crossed a nice stream and continued the final 2 miles to the Timberline Lodge junction. The trail left the cool comfort of the trees and we walked up the sandy mountainside. It was hot, there was very little wind and our shoes filled with sand as we took 2 steps forward and 1 step back. 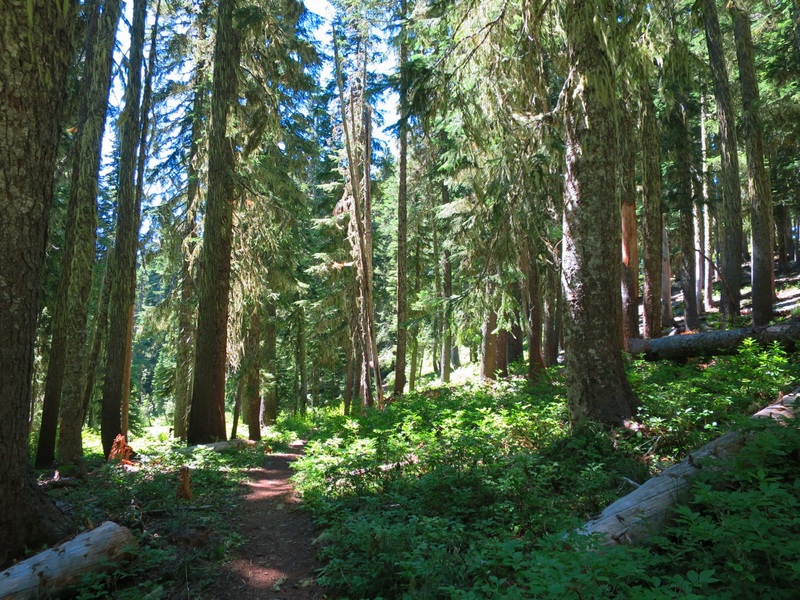 We finally got to a grove of trees with campsites about a tenth of a mile from Timberline Lodge. We set up our tent and ate lunch before heading over to the lodge. Getting into “town” is stressful on our relationship. Out in the woods we are on the same page – we can complete one another’s sentences and communicate through grunts. As soon as we get service or enter a town our differences become apparent. Andy prefers to chill and then slowly check things off his to do list while Laurie wants to finish everything on her to do list then chill. We are very aware of these differences yet struggle to navigate them. Today, Laurie went into the tent to call her mom and do some of her personal “to dos” while Andy stayed outside and relaxed. As these differences arise we search for ways to compromise. Deep down, and not so secretively, Laurie wishes Andy would change to be more like her. We joke about it, both knowing fully well that we have different ways of being in the world and that only adds to the wonder of our relationship. 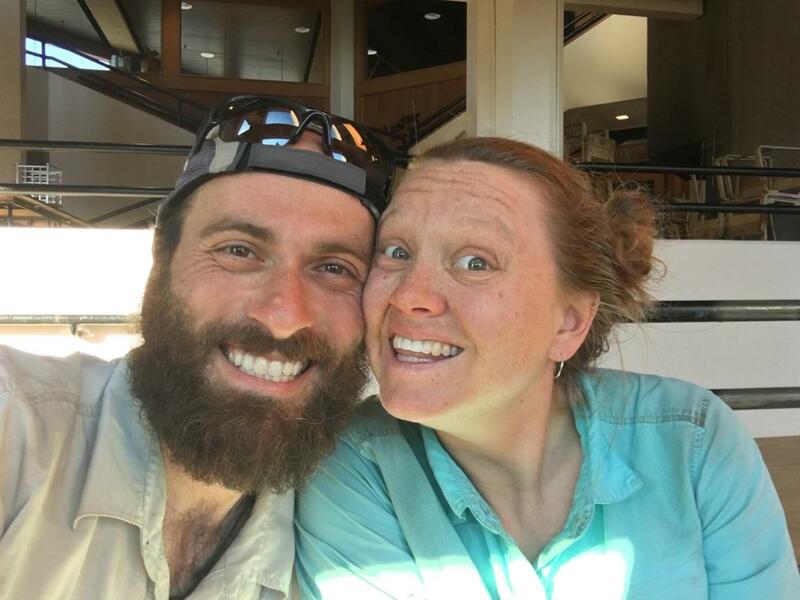 Once we worked out a game plan for the next 24 hours that allowed for both rest and doing, we headed down to the day lodge to get our resupply packages. We separated and sorted on a table near an outlet. 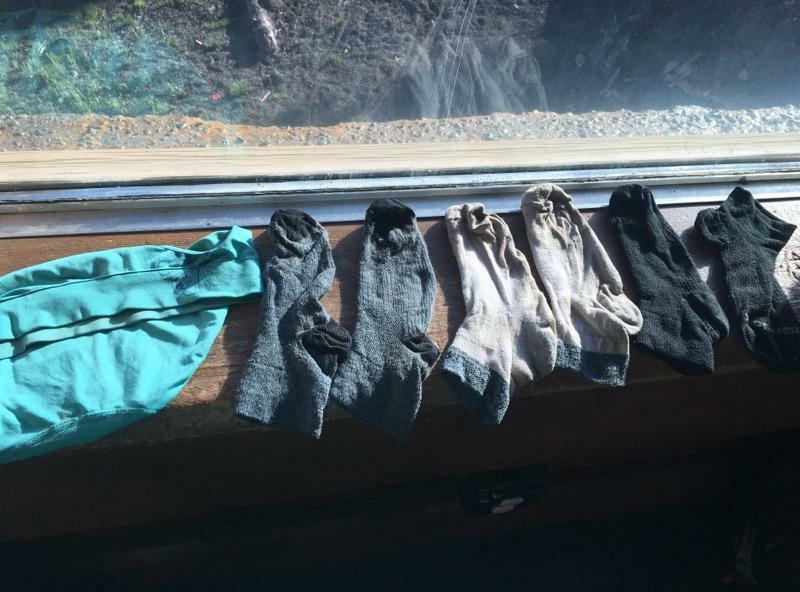 Laurie washed out her socks and underwear, making sure that nobody was in the bathroom to avoid getting dirty looks, and placed them on the sunny windowsill to dry. Once our phones were fully charged, Instagram was updated and family talked with, we went in search of the hiker shower in the overflow parking lot. We passed a barking dog and a man eating out of his car but couldn’t find a shower. There was a porta-potty but neither of us wanted to open the door to see if it was a shower. Even if it had been, we would not have used it. It is only 2.5 days to Cascade Locks and from there Laurie’s friend would be taking us back to her house in Portland for a zero, where we would get a proper shower. We climbed the short distance uphill to our tent and ate dinner. We couldn’t find ice cream but enjoyed the huckleberries nevertheless. We chatted more with family and uploaded blog posts before falling asleep. 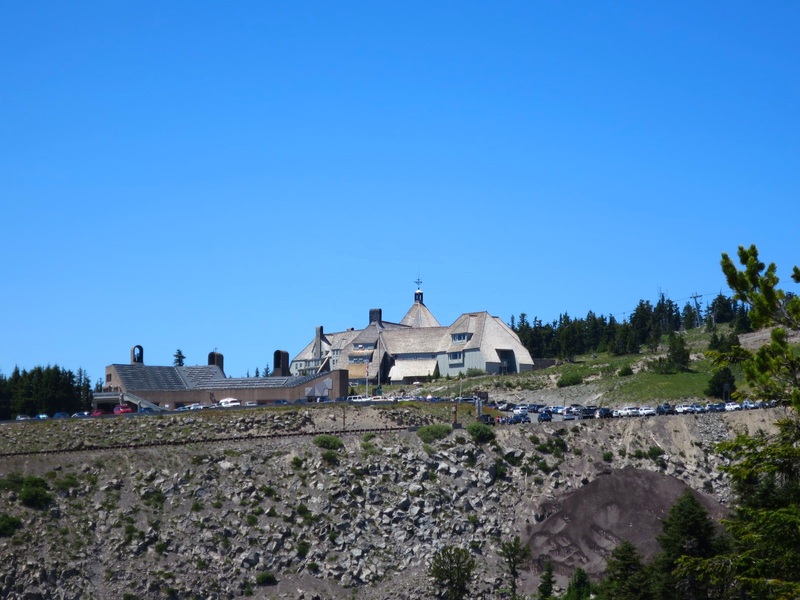 Tomorrow we get to experience the infamous breakfast buffet at Timberline Lodge. Tonight we can dream of eggs and potatoes. Tonight we are grateful for the safe arrival of our resupply boxes and FaceTime. Hiking, what is that? I am here for the berries. 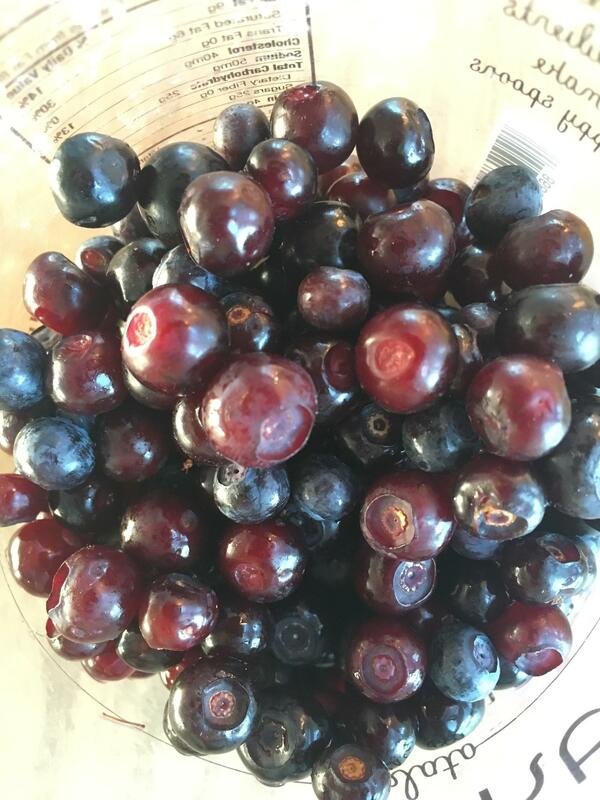 I love Huckleberries! September is the time when you get the big, black juicy ones. Did you get to spread them on ice cream? Sorry I’ll miss you guys when I’m up at Cascade locks 8-11 thru the 13th. Nice to see Oregon has treated you alright. Are you taking the Eagle Creek trail to Cascade Locks?